Transform your experience with young children by exploring how the best curriculum for the young child springs from life itself. Learn how Life, the Child, the Adult and the Environment all form the perfect learning ground for the young child, whether at home or in childcare/preschool. 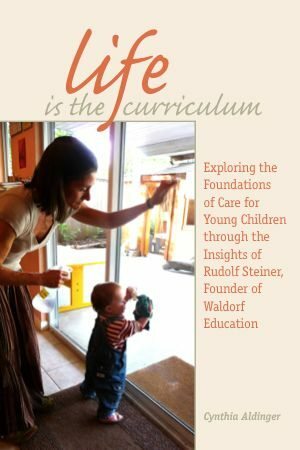 Cynthia describes the principles behind LifeWays childcare with numerous examples and shows how they grow out of Rudolf Steiner’s indication to “take home as the model” to meet the needs of young children. A practical book for parents, childcare providers and early childhood teachers from across the spectrum of approaches today. Available now! 96 pages, with photos. Only $11.95 plus $4.00 shipping and handling—pay with a credit card (through Paypal) or use your Paypal account. About the author: Cynthia Aldinger is founder and executive director of LifeWays North America, an organization dedicated to the development of healthy childcare and parenting practices. Co-author of the book Home Away from Home: Life-Ways Care of Children and Families, Cynthia has lectured and presented internationally, directs trainings and seminars across the United States, and is an Adjunct Faculty member at Rudolf Steiner College in California. She served fourteen years on the board of the Waldorf Early Childhood Association of North America and was a Waldorf kindergarten teacher for many years after she received her Waldorf teaching certificate at Emerson College in Sussex, England. A mother and grandmother, Cynthia’s passion is the preservation of the playful spirit of childhood and helping to create early childhood environments that provide the comfort, security and activities found in a healthy home. Inquire about discounts for study groups or orders of 5 or more copies.